The excellent clarinetist David Rowden is featured on this collection, and his Mozart interpretation on basset clarinet is what one strives for: presenting a piece in a manner that makes the listener hear it in a fresh way. There is a spontaneity that is not heard in many Mozart recordings. Rowden takes advantage of every second statement of a theme or sequence to do something distinctive with dynamics or ornamentation. It is tasteful and in the classical style, but may be a little much for some traditionalists. The “Menuetto” and “Allegretto con variazioni” movements revel in the moments of silence, and the group is completely on the same page here. Releases are refined and delicate. This is a lovely Mozart that is beautifully executed. 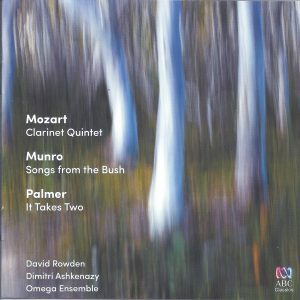 Ian Munro’s 2008 clarinet quintet, Songs from the Bush, is a three-movement work that weaves together Australian and indigenous folk music seeking to create, according to the composer, “a link and a sympathy between the two cultures.” Rowden’s earnest phrasing and nuance elevate any music, especially these folk-inspired melodies. The second movement, “Campfire and Night Sky,” is reminiscent of mid-20th-century English folk tune-inspired quintets, particularly the Herbert Howells Rhapsodic Quintet. The final movement, “Drover’s Lament,” is a lovely treatment of indigenous material. The players channel their inner wanderer with an effective interplay. Munro’s composition is a worthy addition into the rich subgenre of the clarinet quintet. The renowned clarinetist Dimitri Ashkenazy lends his star power for the three-movement double concerto It Takes Two by George Palmer, also from 2008. The programmatic aspects of this work revolve around relationships, friendships and separation. The soloists take turns playing off each other, circling around and eventually coming together in a fun romp of a piece. The first movement opens with a gentle, languid duet, followed by a back-and-forth technical display. The second movement portrays a couple in love separated by distance, a melancholy dance. The last movement is high energy, with many humorous moments. Rowden and Ashkenazy are eerily similar in articulation and timbral beauty. They weave in and out of lines seamlessly, completely in sync with the various styles throughout. The instrumentation is a mixed wind/string configuration of nine instruments, but the recording quality makes the group seem much larger. Overall, the recorded sound is excellent, vibrant and close. The balance is very good, especially in the double concerto. Omega’s musicians are top notch, with a mature sense of blend and cohesion. This album is excellent, highlighting the great work Omega has accomplished in a relatively short period of time. 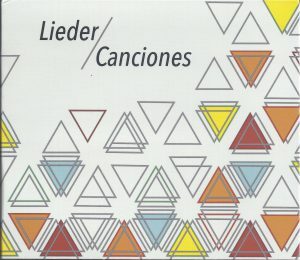 With its debut album Lieder/Canciones, the New York-based trio sTem successfully communicates its mission to “adamantly support the creation of new music and the reimagining of existing works.” The first and third pieces were commissioned by sTem, and serve as the definitive recordings of those works, while the final piece is an original arrangement by sTem. 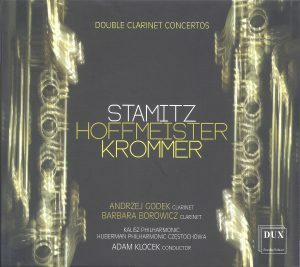 The album’s centerpiece is that staple of clarinet/soprano literature, Schubert’s Der Hirt auf dem Felsen, D. 965. Das Stunden-Buch, one of sTem’s first commissioned works which was premiered in 2013, was composed by Los Angeles-based Rex Isenberg. Isenberg borrowed four poems from Rainer Maria Rilke’s 1905 collection Das Stunden-Buch, which is itself modeled after the traditional Christian manual “Book of Hours.” Vastek and Umble open with a dramatic introduction of alternating, rumbling arpeggios. Their roiling intensity weaves itself through all four movements, building a narrative founded on divine struggle. Brus and Umble demonstrate their masterful command of altissimo at several moments, culminating in an atmospheric event in the fourth movement, “O Herr.” Brus pleads to God for a death that comes after living a life full of love, meaning and need, as she and Umble ascend to the edges of their range. A beautifully unhurried performance of Schubert’s Der Hirt auf Felsen follows. From the beginning, there is a marked difference in recording quality. Recording aside, sTem’s ensemble playing is beautifully executed throughout, especially in the end of the first section and throughout the minor transitional section. The other original commission to appear on this album, Preludio de un Diamante, was written by the Mexico City-based composer Giovanni Piacentini. Piacentini used the poetry of Fausto Alzati, also from Mexico City. With piano and clarinet, Piacentini skillfully builds coloristic textures that depict the moods suggested by the text. “Apenas” (Barely) depicts a space dense with openness. It begins with a meditative clarinet solo consisting of drawn-out lines, wide leaps and extra reverb courtesy of an un-dampened piano. “Sala de Espera a Dios” (Waiting Room for God) opens with a dreamlike ostinato played by Vastek. “Fiebre” (Fever) also opens with a feverish ostinato, an insistent three against two cross-rhythm. sTem closes their album with an original arrangement of “Escúchame,” the final aria from Daniel Catán’s 1996 opera Florencia en el Amazonas, libretto by Marcela Fuentes-Beraln. Florencia, traveling down the Amazon for a performance in Manaus in the hopes that she finds her lover, has learned that the city is experiencing a cholera epidemic and is closed to travelers. In “Escúchame” (Hear Me) she realizes that her lover may be dead, though she can still feel his presence. As the aria concludes, Florencia transforms into a butterfly to reunite spiritually with her lover. Brus’s performance overflows with emotion from her opening line to her final portamento, and Umble beautifully complements with his nuanced, coloristic playing. In general, recording engineer Chris Abell and mixer Chris Camilleri privilege Meagan Brus’s vocals over the clarinet and piano, often to the detriment of the clarinet. Too much of Umble’s sound was lost, in some cases even to the reverberation of the piano accompaniment. The strongest aspects of sTem’s first album are their collaborations: with each other, with Isenberg and Piacentini, with Catán and his music. For Brus, Umble, and Vastek, it is within this fertile ground that the strength of their musicality and commitment to their art shines the brightest. After their first recording as an ensemble, Prime Registrazioni, the Stark Quartet’s sophomore offering showcases Italian clarinet solo and ensemble music from the 19th and 20th centuries. It is aptly named Il Clarinetto tra Ottocento e Novecento dal solo al quartetto (The Clarinet in the Nineteenth and Twentieth Centuries from Solo to Quartet). Clarinetists know Cavallini, but this album also shines light on arrangements and lesser-known Italian composers. The disc includes premiere recordings of works by Scarlatti and Guglielmo Cappetti. 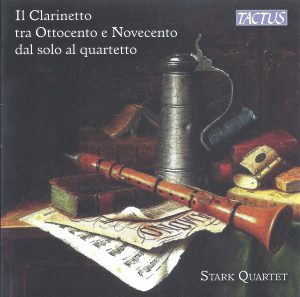 The Stark Quartet – comprised of clarinetists Vinibaldo Baccari, Sauro Berti, Sergio Brusca and Antonio Fraioli – provides convincing interpretations for these works. The performers are also arrangers, composers and historians. Some of these works would be lost to history without this group’s dedicated efforts. An egalitarian ensemble, they perform in various combinations, from solo to trio and quartet, and sound well matched in any configuration. For quartet, the works by 20th century composers Raffaele Gervasio and Henghel Gualdi stand out. Gervasio’s Nel Vivo, Op. 127, demonstrates the energy and excitement the composer brought to his film scores. It offers contrasting sections where the quartet can display alternating flashes of virtuosity and beautifully delicate moments. Gualdi, a clarinetist and composer considered a foremost proponent of jazz in Italy, wrote Breve Preludio. He proves to be a composer fluent in many musical languages, though the piece has excellent opportunities for the quartet to show their jazz chops. Ernesto Cavallini’s two quartets are showpieces and sound like great fun to perform. The performers give his works a pulsing energy throughout. These works contrast each other nicely. The Stark Quartet works equally well as a trio with rotating personnel. In this configuration, they move to earlier works by Domenico Scarlatti and Giuseppe Gherardeschi. Scarlatti’s Keyboard Sonata in G Minor is the only arrangement. It gives the three musicians equally interesting parts and sounds like good material for student ensembles. Gherardeschi’s Five Sonatas complete the trio portion of the disc. These short compositions have charming character but sound somewhat monotonous when played in a row. There are also momentary lapses in the ensemble’s intonation, which was so sure in the quartet configuration. This recording skips over duets, but gives both Antonio Fraioli and Sauro Berti the chance to show off with solo works. Fraioli’s turn features three premiere recordings of works by Guglielmo Cappetti. Cappetti wrote for clarinetists with virtuosic technique in the golden age of the instrumental virtuoso. Fraioli is up to the challenge, turning in technically brilliant, fluid performances. Valentino Bucchi’s Concerto per Clarinetto Solo is no less virtuosic but offers a different set of challenges. It demands various extended techniques, flawless registral control, and lightning-fast articulation. Berti handles these challenges with impressive musicianship and fluid technique. This selection stands out as exceptional. This disc continues to establish the ensemble as an intelligent, humorous group doing excellent work. The diversity in styles and time periods presents a challenge that the Stark Quartet handles quite well. Clarinetists interested in learning new repertoire for chamber ensembles will love this recording. 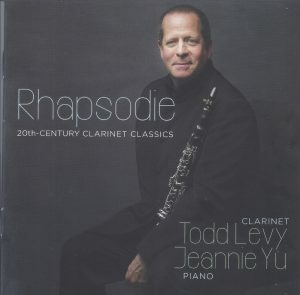 Clarinetist Todd Levy, pianists Jeannie Yu and Elena Abend and guitarist Rene Izquierdo curate an eclectic collection of works with a wide range of styles on Rhapsodie: 20th Century Clarinet Classics. The recording strikes an excellent balance, pairing the traditional with a few lesser-known and/or lesser-performed works. Throughout, Levy exhibits excellent technique, but what makes his playing truly notable is the manner in which he draws the listener in with a distinct voice, exhibiting a beautiful, special kind of tone. There is something unique in Levy’s sound: a multilayered timbre that offers plenty of depth, but does not leave any hint of heaviness or inflexibility. He shapes musical phrases subtly, with singular attention paid to the shape and color of individual notes. The effect captivates the listener, as he brings about an overarching musical structure, while individual notes demonstrate a life of their own. Levy puts a distinctive mark on Gerald Finzi’s Five Bagatelles; it is an engaging interpretation, with plenty of rubato and subtlety of shaping. The second movement is particularly notable as Levy displays a quiet introspection. He eases the listener in, engaging them with something that is stark and personal. The return of the “A” section is wistful, reminiscent and dreamy. There is a comfortable ease to Levy’s playing as he begins the Bernstein Sonata with a presence in his tone, without sounding forced. He employs a softer, non-obtrusive articulation, resulting in a unique timbre that is a bit different from other recordings. Jeannie Yu plays with wonderful sensitivity, and their ensemble is excellent and well-balanced. One section worth mentioning is near the end of the second movement, right before return of the main theme in the beautiful slow section. Levy’s use of color captivates the listener and creates a truly magical moment. In Bartók’s Romanian Folk Dances, Levy alters his sound at times – rawer, breathier and buzzier. This is what one might expect to hear in a piece of this type, with a nod to and flavor of Eastern European folk music. Notably, Levy piques the listener’s interest and pulls them in during “Pe Loc.” The Debussy is elegant, colorful, and subtle in all the right places. A wonderful interpretation that does not overdo; this is exactly how Debussy should sound. Libby Larsen’s Blue Third Pieces for clarinet and guitar offers a departure of sorts and aids in giving the recording additional variety. While “Deep Blue” strikes an aesthetic that feels a bit academic, “Salt Peanuts” is developed a bit more, with Izquierdo giving us great style and flair. Larsen’s nod to blues and rock (including a brief and delightful homage to Ray Charles) is excellently executed by Izquierdo, and Levy adds to the style by offering glissandos and pitch bends. In Kovács’s Hommage à Manuel de Falla, Levy executes a rather controlled interpretation and, as a result, distinct sections tend to lose their impact. This is surprising, considering the excellent form and structure Levy crafts and delineates in his interpretation of other works. This performance could benefit from more differentiation between characters and mood changes; a bit more time to give the audience a chance to catch their breath between phrases and sections; and exaggerated phrasing to highlight the nod to de Falla that Kovács captures so well in the composition. Among Paquito D’Rivera’s works on the recording, the Vals Venezolano is a standout. Levy exhibits colorful and easy sounding interpretation that pleases and brings a smile to the listener in this wonderfully simple and tuneful work. Levy is an outstanding musician and artist, with soft, subtle and colorful playing as his forte. Focused and multiple listening of this recording is a must, as one does discover new and exciting colors, timbres and sounds that might not have been perceived upon first hearing. 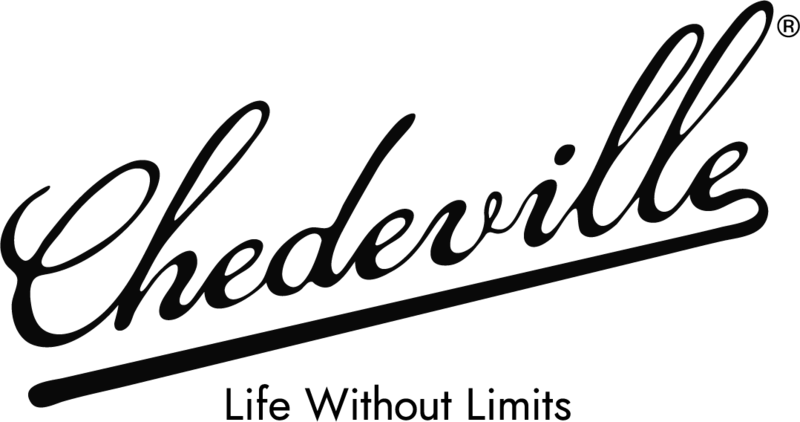 There are rare times where the listener might want to hear Levy “go for it” and explore the extremes of the different styles. However, Levy captivates the listener with a signature style and artistry unique to him alone. 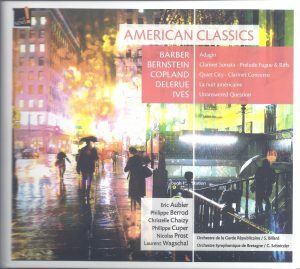 American Classics is a compilation of music for winds and strings by prominent American composers performed by acclaimed French musicians. Clarinetists Philippe Berrod and Philippe Cuper are featured on three of the nine works on this CD, along with several well-known soloists and concert performers, many of whom are members of major Parisian ensembles. Philippe Berrod serves as the principal clarinet of the Orchestre de Paris and principal professor of clarinet at the National Conservatory of Music in Paris. Philippe Cuper serves as the principal clarinet of the Paris Opera, and professor of clarinet at the Versailles National Conservatory. Two versions of Aaron Copland’s Quiet City are included on this CD, one for trumpet, English horn and strings, the other for saxophone, clarinet/bass clarinet, trumpet and piano. Copland composed incidental music for Irwin Shaw’s play The Quiet City in 1939; however, the production was canceled after two performances. Copland made two arrangements of this work, the concert version included on this CD for trumpet, English horn and strings, and another that was used for the movie Our Town. The version for saxophone, clarinet/bass clarinet, trumpet and piano was reconstructed from original manuscripts by saxophonist Christopher Brellochs and premiered in 2010. Philippe Berrod is joined by Eric Aubier, Nicolas Prost and Laurent Wagschal on the recording of Quiet City for saxophone, clarinet/bass clarinet, trumpet and piano. Tuneful themes are juxtaposed with pastoral harmonies, driving rhythmic sections and heroic fanfares, allowing one to imagine various scenes from the original theatrical production. Berrod’s clarinet and bass clarinet playing exhibits technical mastery and great musical sensitivity, as do his fellow musicians who seamlessly blend the unique timbres of their respective instruments into a cohesive whole. Berrod is joined by pianist Laurent Wagschal for the Sonata for Clarinet and Piano (1941-42) by Leonard Bernstein. Berrod’s beautiful tone complements the lyrical style of the first movement and phrasing is well-coordinated between players. The tranquil opening of the second movement also highlights the great musical sensitivity of Berrod’s playing, giving way to the driving Vivace e leggiero, which demonstrates great clarity and precision on behalf of both players in even the most technically demanding passages. Philippe Cuper is accompanied by the Orchestre Symphonique de Bretagne under the direction of Claude Schnitzler on a recording of Aaron Copland’s Concerto for Clarinet and String Orchestra with Harp and Piano. The concerto was commissioned by Benny Goodman in 1947 and completed in 1948. Cuper’s sound floats effortlessly over the ensemble with beautiful phrasing exhibited by both soloist and orchestra in the first movement of this work. Cuper executes the cadenza linking the two movements of this concerto with flawless precision, incorporating subtle nuances such as the tasteful use of vibrato, harkening back to the clarinetist who commissioned the work. Cuper brings a sense of energy and excitement to the second movement of this concerto, all the while maintaining the sense of clarity and precision demonstrated earlier. Overall, this is an enjoyable CD and holds value for clarinetists and non-clarinetists alike. The recording quality is excellent, and the playing exhibited by all performers and ensembles is of the utmost quality. The works included (even non-clarinet) are a good representation of musical style exhibited by several prominent American composers. Previn Plays Previn is not a full album but rather a live recording of two world premieres of André Previn’s compositions for clarinet. The originality of the works combined with an outstanding level of artistry make this a welcome addition to any musician’s personal collection. The recording begins with Previn’s Sonata for Clarinet and Piano and concludes with his Quintet for Clarinet and String Quartet. It is not mere conjecture to state that the performers seem ideally suited to these compositions. 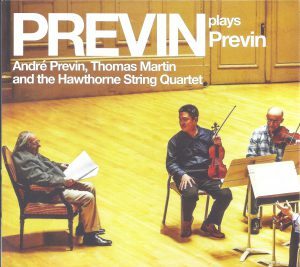 Previn himself is quoted in the liner notes as stating, “I prefer to compose for artists I know…” He goes to on to refer to his past collaborations with the artists on the disc stating, “I knew Tom’s playing and…also, the Hawthorne String Quartet.” The collaboration between artist and performer on the album – and the very inclusion of the composer as a performer – makes this a uniquely connected experience. Tom Martin, associate principal clarinet of the Boston Symphony and principal clarinet of the Boston Pops Orchestra, is consummately effective on this recording, exhibiting his characteristic warm sound in all the registers of the instrument. In the sonata, his technical prowess and profound musicianship match André Previn’s astounding artistry phrase for phrase. Recorded in 2010 in Prague, both musicians give musically exciting and technically commanding performances. They exhibit such range and control on their respective instruments that the resulting recording is an emotional tour de force. Previn’s compositions are anything but pedantic and he takes the listener into an unexpected musical landscape combining strains of jazz and contemporary idioms with more traditional forms. The addition of the Hawthorne String Quartet to the second piece on the album is a wonderful contrast. Previn’s clarinet quintet was commissioned by the Terezín Music Foundation as a tribute to musicians who died at Terezín. It was recorded in Symphony Hall, Boston in 2011. In this work, Martin really shines as a virtuoso, floating in and out of the altissimo register with ease. This effortless timbre combined with the Hawthorne quartet results in a glorious musical effect, especially in the second movement, titled “Slow and Lonely.” This gem of a musical composition is bookmarked by two faster movements in which the clarinet alternately combines with the strings and then departs in virtuosic expression. Martin and the Hawthorne Quartet sound right at home in both the jazz- and classical-influenced writing. Because the pieces are recorded live, the listener should not expect an overproduced studio sound. Instead, the listener is treated to an exhilarating concert experience, complete with the acoustics of a large venue. The Czech Television engineers capture the wonderful characteristics of one of Europe’s most distinctive concert halls. The Boston recording of the Quintet has a warmer and more present sound by contrast. This recording, produced in Poland, was the result of a project implemented as part of the “Ars Quaerendi” Award of the Maŧopolskie Voivodeship for outstanding activities to promote and develop the culture. The clarinetists are both faculty members at the Music Academy in Krakow. Andrzej Godek is professor of clarinet and chair of the woodwind department where he has taught since 1975. Barbara Borowicz, a former clarinet pupil of Godek, is now a clarinet lecturer at the Krakow Academy. The first piece on this CD is Concerto No. 4 in B-flat Major for 2 Clarinets and Orchestra by Carl Stamitz (1745-1801). In the first movement, the orchestra provides a strong opening with singing melodies and contrasting dynamics. The clarinets provide their opening theme, each soloing at first, then together in harmony. The second theme features a triplet pattern in which each player ably demonstrates incisive articulation. A short cadenza offers a little more technical pizzazz. The second movement begins with a lyrical melody in the orchestra. The clarinets again enter alone at first and then combine in thirds. The triplet accompaniment adds to the beauty of this movement. The clarinets contribute to the mournful quality of the movement and in the cadenza. The last movement is a charming rondo in the style of a minuet. It’s quite lovely. The balance between Godek and Borowicz is excellent in each movement and the style skillfully performed. Franz Anton Hoffmeister (1754-1812) was born in Rothenburg, Germany, but moved to Austria and became a composer and publisher. His Concerto in E-flat Major for 2 Clarinets and String Orchestra begins with a brisk-paced orchestral exposition followed by the first clarinetist playing the lyrical theme while the second player delivers a barrage of spirited scale and arpeggio runs. The second theme features both playing together, often in thirds, with beautiful lyrical lines. The cadenza is cleverly innovative. Both players, in thirds, play lyrical lines and in the middle a perky tune appears – perhaps a polka? The slow movement purveys an elegant, even somber mood. The string accompaniment is notable for its delicate background. The finale is again a rondo and it should be electrifying to any listener. This concerto leaves no doubt as to the acumen of both players because the technique is impeccable, the rhythm is solid, the articulation is crisp and musicianship abounds. The orchestra is larger and includes more winds, and the balance between the two solo instruments and the orchestra is excellent. The last piece is Concerto in E-flat Major for 2 Clarinets and Orchestra, Op. 35, by Franz Krommer (1759-1831). In this concerto, the first movement is an Allegro with ample technical challenges for both soloists, but with some very nice lyrical moments. The second movement, in minor, has a somber opening theme in the orchestra. The angular clarinet lines could be described as pensive. The Rondo is jaunty with plenty of virtuoso passages, which Godek and Borowicz handle deftly. Praise must also go to the orchestras, the Kalisz Philharmonic and the Huberman Philharmonic Częstochowa, as Maestro Adam Klocek and his musicians provide carefully crafted accompaniments. The English translation of the liner notes is not always clear and even awkward at times – likely the Polish version is better. The recording is carefully balanced and clear. This CD is highly recommended! The Ostrava Clarinet Quartet arose spontaneously as faculty members at the Ostrava Festival; they have been performing together since 2002. Montilla, a graduate of Indiana University and the former principal clarinet of the Simón Bolívar Symphony Orchestra, has appeared internationally with the Caracas Clarinet Quartet and as soloist with numerous Venezuelan orchestras. Adamski, principal clarinet of the National Polish Radio Symphony Orchestra, has performed as a soloist and chamber musician with numerous orchestras and ensembles all over the world. Františák has performed as soloist with the Janáček Philharmonic, the Bohdan Warchal Slovak Chamber Orchestra, the Kurpfälzisches Kammerorchester Mannheim and the Talich Chamber Orchestra. He is also associate professor of clarinet at the University of Ostrava. Dohnal has performed widely throughout Europe, North and South America and Asia as a soloist and chamber musician with ensembles including the Tokyo and Talich String Quartets. The disc opens with a transcription by Montilla of Aldemaro Romero’s Fuga con Parajarillo. Venezuelan-born composer Romero became an arranger for RCA Victor in New York and worked with artists including Dean Martin, Jerry Lee Lewis, Stan Kenton, René Touzet, Machito and Tito Puente. Fuga con Parajarillo is a Latin-style orchestral work from 1990 brilliantly arranged for the ensemble by Montilla. The players perform with excellent rhythmic precision, blend and style in this work. Intonation and tone quality are excellent with special credit to Montilla for his light and technically brilliant E-flat clarinet playing. Melodic balance is handled extremely well as is homogeneity of color by the ensemble. As if Snow is Falling by Czech composer Petr Wajsar is a world-premiere recording on this disc. 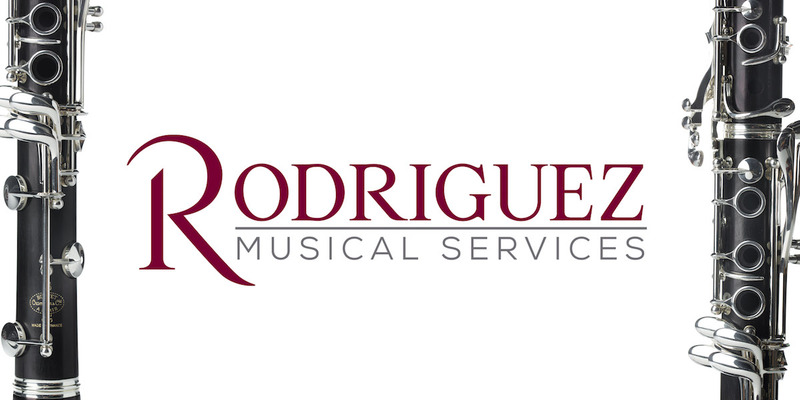 This fun, lighthearted music can be described as Dave Brubeck with a Latin flavor. It opens with brilliant, syncopated material that suddenly turns into a beautiful chorale, performed with beautiful, sensitive phrasing and excellent intonation. The listener is gradually brought back to the rhythmically exciting opening material that builds to a rousing conclusion. Again, ensemble playing is excellent in this performance. Darius Milhaud’s classic Scaramouche is arranged by Philippe Portejoie, who is also featured as guest saxophonist in this recording. In the opening movement “Vif,” the saxophonist overpowers the ensemble a bit. Also, at times, cleanliness of ensemble isn’t as aptly demonstrated as in other works on this disc. Possibly due to the arrangement and/or studio balancing, the overall sound is treble heavy with not enough clarity of articulation in the clarinets. The second movement, “Modéré,” is very clean, careful and balanced but somewhat lacking in soulful character by Portejoie. Similarly, in the “Brazileira,” Portejoie’s playing is polished, but not as stylized as it could be. The accompanying clarinets, however, play brilliantly with impeccable articulation, intonation and style. Another classic, Astor Piazzolla’s “Night-Club 1960” from Histoire du Tango is arranged here by Bruce Edwards. Simply put, the ensemble playing is outstanding. The opening dance material is energetic and brilliantly played with special acknowledgement to bass clarinetist Dohnal for his rich, beautiful sound. Octave intonation in this work, which is obviously a challenge, is impeccable. The slow material is sung beautifully by the lead clarinetist with excellent sensitivity by the accompanying members. Technical command and rhythmic precision demonstrated by each player are superb in this performance. Following the Piazzolla is Jazz Sketch No. 2 “Free Jazz” by Czech clarinetist and composer Aleš Pavlorek, another premiere recording on this disc. This brief “sketch” is a delight in its playfulness and use of acrobatic writing for each player. The technical handling of this obviously difficult music is admirable with only tiny moments of isolated attacks that are not completely together. Otherwise, the players are commended for this overall excellent performance. Pedro Iturralde is a Spanish composer, saxophonist and teacher. Minatura Impromptu is a short work alternating between Latin dance, American jazz and lyrical canzona styles. The lead clarinetist is commended here for his tasteful use of glissandi and jazzy style. The canzona sections are especially beautiful in the performance. The second work on this disc by Aleš Pavlorek is A Little Suite, a work in three movements titled “Preludium,” “Valzer” and “Rondo: Vivace.” The “Preludium” is hauntingly beautiful with its unique harmonies and elegiac style. Excitement builds in the middle of the movement but the listener is brought back to the calmness of the opening. The “Valzer” is delightful in its push and pull of tempo and unconventional harmonies. Its unsettledness as a waltz may remind the listener a bit of Berlioz’s Un Bal. The ensemble fully exploits the quirkiness of this music. The “Rondo: Vivace” is a rousing tour de force that keeps the listener on the edge of their seat. The movement alternates between beautifully played soft, lyrical sections and rhythmically charged, virtuosic material that concludes the piece quite effectively. This work is the highlight of the disc. The disc concludes with Milan Dvořák’s Bossanova, arranged by Aleš Pavlorek. This lovely, very short work cleanses the listener’s palate after the more musically adventurous Suite. The finally note of the piece, a pianissimo slap tongue by the bass clarinetist, can only leave a smile on the listener’s face. My only criticism is, with the exception of Pavlorek’s Suite, the overall similarity in style of the works offered on this disc. Perhaps an inclusion from the traditional clarinet quartet canon would have added a welcomed variation to the repertoire. However, this is overall a musically and technically outstanding recording.